Which fuel is best for heating a greenhouse? The right answer depends on price, convenience, and availability. Some fuels have more “heat per dollar” and some heating units have a greater efficiency. Others are especially easy to use. All of these factors need to be considered when deciding what fuel to use. The most common fuels for greenhouse heating are natural gas, propane, and fuel oil, but several “alternative fuel” options are available that might be a good option for a grower. A good way to compare the cost of fuel is on a million Btu (or 1 gigajoule) basis. What is the cost of one million Btu’s of heat? By definition, one Btu equals the amount of energy required to raise a pound of water 1 degree F. It takes 8.3 Btu’s to raise 1 gallon of water 1 degree F. In metric units, we use joules instead of Btus, but 1 gigajoule is nearly the same magnitude as 1 million Btus (1 Million Btus = 1.05 gigajoules). 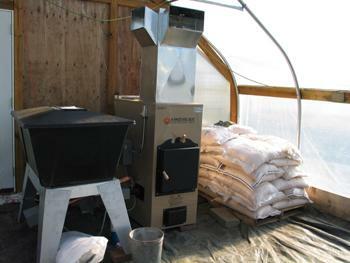 This is one of the most economical fuels, although it is not available to growers in all areas. It needs no on-site storage as it is piped from transmission lines. Natural gas burns cleanly, requires little equipment maintenance and may be used in central boilers or remote unit heaters. Some suppliers include an “interruptible clause” that allows them to turn off your supply in time of extreme need, usually during cold spells when fuel is needed to heat homes. A backup fuel supply and equipment to burn it are essential under these conditions. For larger users, it is best to buy “direct purchase” from one of the large suppliers near a well head. Adding the transmission cost through the pipelines will give you a total fuel cost. Liquefied petroleum gas is a clean, gaseous fuel much like natural gas. It is obtained as a byproduct of oil refinery operations or by stripping natural gas. It is liquefied by moderate pressures at normal temperatures. Although more expensive than natural gas, it can be readily obtained where natural gas in not available. Maintenance is minimal, but a storage tank and preheater are needed. Propane is best purchased by the transport load, which requires a 30,000-gallon tank, usually buried. Purchase should be made during the time of year when the price is lowest. No. 2 oil is commonly known as home heating oil and is nearly identical to diesel engine fuel. It is usually comparably priced with natural gas but may be more expensive in some locations, especially where it has to be transported a long distance from the supply point. It is a relatively clean fuel (especially with the recent switch in the United States to ultra-low sulfur fuel) that demands slightly more burner maintenance than gas. Oil requires on-site, above-ground storage tanks that must have a containment in event of a leak or spill. Oil stored in outdoor, above-ground tanks may become difficult to pump in very cold weather. Insulated tanks or additives to the fuel protect against this hazard. These have a higher heating value than No. 2 but, because of low-sulfur restrictions, they are usually similar in price. These oils require preheating and greater attention to equipment operation because they are more viscous (thick) than No. 2 oil. They are subject to the same storage and temperature limitations as No. 2 oil. Contracting for the winter’s fuel needs when the price is low, usually August or early September, can save considerable money and insure that you have a supply for the winter. A heating system using an alternative fuel can be installed to meet the total heat needs of the greenhouse but is generally not the most cost effective approach. It is more common to install a smaller system that will supplement the present heating system and provide for part of the heat needs. It is only for a few hours per heating season, the coldest nights, that you need the total installed capacity of the furnaces or boilers. Most heating systems that use an alternative fuel tend to be more expensive to install than a conventional furnace or boiler that is mass produced. To be attractive, the fuel or heat source should be readily available at a low cost. Even though there has been little government support for research on alternative fuels, considerable progress has been made in developing more efficient equipment and systems during the past few years. Systems that burn fuels such as wood, coal and waste oil require more attention and labor. Maintenance costs may also be greater and should be taken into consideration. The following is a short review of some of the more common alternative fuels and heat sources. A detailed economic study should be done before purchasing a system. It may be a better choice to invest in upgrading the present system to make it more efficient. Where readily available, wood is an important alternative. The fuel is relatively inexpensive as forest residue, mill waste, chips or sawdust. The cost is in the transportation and handling. For example, the fuel oil requirement for a 20,000-sq.ft. greenhouse located in Connecticut would be about 20,000 gallons for the heating season. If wood is substituted as a fuel source, it would require about 110 cords of hardwood. This means handling about 220 tons if the furnace was fired by hand. The cost of the wood is only $6,000 delivered in log length compared to about $35,000 for the oil. This difference is enough to have a reasonable payback for the equipment and to pay for a night fireman. Furnaces and boilers that burn cordwood, chips and sawdust are available. The heat value of the fuel depends on the moisture content. For example, green, whole tree chips have a heat value of about 8 million Btu/ton whereas dried chips will give about 14 million Btu/ton. If the wood is burned at high temperature (more than 1,500 degrees F), very little smoke or pollution occurs. Most commercial units meet 2010 Environmental Protection Agency (EPA) standards. Coal is a low-cost fuel source in some areas. Most coal used in the eastern part of the United States is anthracite. Bituminous coal is more common in other parts of the country. The farther you are from the mines, the greater the cost, due to the increased transportation. One ton of coal has the equivalent heat value of 150 to 180 gallons of fuel oil or 2,100-2,500 therms of natural gas. A coal heating system requires more labor to operate, produces ashes that have to be disposed of and requires a covered storage area to prevent it from freezing. Operation is usually more difficult as the ignition temperature is 800 degrees F. to 900 degrees F. compared to about 550 degrees F. for wood. Collection centers for waste oil from cars and trucks are common throughout the United States. Some of the oil is cleaned and reused for lubrication. Much of it is available as a fuel at a few cents per gallon. Waste oil that has not been processed requires a settling tank to trap water and sludge. Considered a hazardous waste, these have to be disposed of to meet EPA regulations. Waste oil has a heat equivalent of about 135,000 Btu/gallon, similar to No. 2 fuel oil. Furnaces and boilers designed to burn waste oil are available in many sizes. They have automatic control and operate similarly to an oil or gas unit. Methane is a combustible gas that is commonly available from landfills or from the decomposition of animal manure. If cleaned of impurities, it could be used to power autos or other engines. Methane straight from a landfill can be burned directly in a suitable furnace or boiler. It has a heat value of about 500 Btu/cu.ft., about half that of pure methane. There are many sources of heat that are going to waste. Common sources include process manufacturing, incinerators and power plants. Some plants are set up to generate electricity and give heat as a byproduct. The heat may be available as high temperature water or steam but more commonly can only be obtained as low-grade heat of less then 150 degrees F. In many cases, a “unit heater” style heat exchanger is needed to recover the heat for use in a greenhouse. Sometimes, the water can be put directly into a floor heating system. The temperature of the soil at 8 to 12 feet below the surface remains fairly uniform at about 50 degrees F. year-round at moderate altitude. Water in wells or ponds also stays about the same temperature. In some areas of the United States, high temperature water or steam is available from deep well sources. There is a potential to capture this heat either directly as with the high temperature steam or through heat pumps or earth tubes to help heat a greenhouse. Heat pumps work like a refrigerator in reverse, taking the heat from the ground source and transferring it to the greenhouse. Earth tubes capture the heat in ventilation air that is then blown into the greenhouse. The 50-degree-F. air or water could also be used to cool the greenhouse in the summer. The cost of most geothermal systems is fairly high and many things need to be considered before installing such a system. Although significant savings are possible with the above systems, a substantial investment in equipment and facilities may be required. A thorough analysis of the economics and fuel or heat reliability should be made. It is also best if you can talk to other growers who have similar installations. The simplest way to analyze an alternate fuel option is to calculate its “simple payback” – the number of years it takes to recover the cost of installing the alternate fuel system. Simple payback is equal to the cost of installing the system, divided by the annual cost savings from the system. For example, if a wood boiler costs $100,000 to install, but saves $40,000 per year, the payback is $100,000/40,000 = 2.5 years. Most growers should only consider installing an alternate system if the payback period is less than five years. Energy Cost Comparison Charts. Penn State Cooperative Extension. This Energy Calculator is a user-friendly decision aid for easy comparison of the heating values available from any two energy sources.